iRod Fit Hats let you show a little style on the water and keep you cool. Hook and loop adjustment for comfortable fit, they are comfortable, durable and the quality you’d expect from iRod. 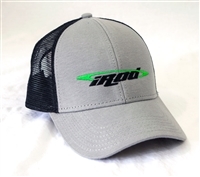 iRod Trucker Hats let you show a little style on the water and keep you cool. Flexfit for comfortable fit, they are comfortable, durable and the quality you’d expect from iRod.